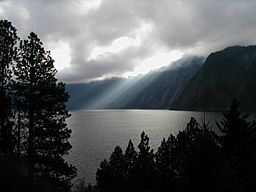 Farragut State Park is a state park in the northwest United States, located in northern Idaho at the southern tip of the Lake Pend Oreille in the Coeur d'Alene Mountains. The 4,000-acre (16.2 km2) park is 5 miles (8 km) east of Athol in Kootenai County, about 30 miles (50 km) northeast of Coeur d'Alene. Activities include camping, picnicking, hiking, mountain biking, cycling, fishing, boating, swimming, water sports, orienteering, disc golf, flying model aircraft, archery, and horseback riding. The site formerly held the Farragut Naval Training Station, a major training base of the U.S. Navy during World War II. The base was named after David Farragut (1801–1870), the first admiral in the U.S. Navy and the leading naval officer during the Civil War. Ground was broken 77 years ago in March 1942 and its first phase opened in early August; by September the base had a population of 55,000, making it the largest city in Idaho. It was the second-largest naval training center in the world at the time, and liberty trains ran three times daily to Spokane, Washington, about an hour away. The base was visited by President Roosevelt and movie star Lana Turner, who spent her first six years in northern Idaho at Wallace. Roosevelt's visit in September 1942 was kept secret until he returned to Washington, D.C.
Over 293,000 sailors received basic training at Farragut during its 30 months of existence. The last recruit graduated in March 1945 and the facility was decommissioned in June 1946. It was also used as a prisoner of war camp in 1945, run by the U.S. Army; nearly 900 Germans, most captured shortly after D-Day, worked as gardeners and maintenance men. Migrating deer were a traffic hazard and hunting was prohibited on federal property. In 1942, Lt. Commander Henry T. McMaster, supervisor of support services at the station, contracted photographer Ross Hall to produce group and portrait photos of all recruits and companies. Operator of a studio in nearby Sandpoint, Hall employed up to 15 workers in creating a photographic archive of more than 300,000 images. After its use and closure as the Farragut Naval Training Station, the site housed "Farragut College and Technical Institute" for three years, beginning in 1946. It did not re-open in late 1949, because of financial difficulties. A remaining park feature is the Museum at the Brig, located in the confinement facility of the naval training station. It displays include boot camp, naval, and war memorabilia, as well as historic prison cells. The park adjoins the deep-water on Lake Pend Oreille, where the Navy maintains a submarine research center at Bayview, the Acoustic Research Detachment. In 1950, 3,854 acres (15.6 km2) were transferred to the state of Idaho and the Idaho Department of Fish and Game and became Farragut Wildlife Management Area, but 2,566 acres (10.4 km2) were transferred back to the federal government in 1964. This land was then deeded back to the state of Idaho and the Department of Parks and Recreation, becoming Farragut State Park. Farragut State Park is significant in the history of Scouting in Idaho. It hosted the National Girl Scout Senior Roundup in 1965, the World Scout Jamboree in 1967, the National Scout Jamboree in 1969 and 1973, and the 2002 Star Northwest of the Boy Scouts of America. The world event in 1967 was the only time the event has been held in the United States. While traveling to the moon aboard Apollo 11 in July 1969, astronaut Neil Armstrong extended a greeting to the Scouts attending the national jamboree in Idaho. Armstrong was an Eagle Scout from Ohio. Frank Borman, astronaut and commander of Apollo 8, addressed the Scouts, as did Lady Baden-Powell, the widow of Scouting's founder. At the Jamboree in 1973, Admiral Elmo Zumwalt, Chief of Naval Operations, and Gene Cernan, astronaut and commander of Apollo 17, addressed the Scouts. Farragut State Park Facts for Kids. Kiddle Encyclopedia.